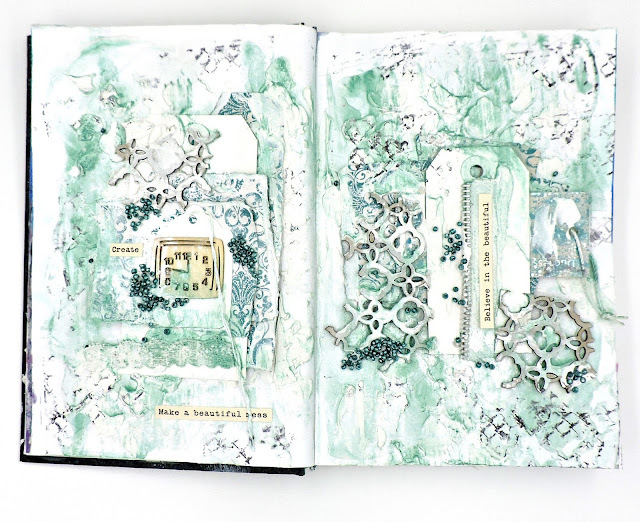 Marta Lapkowska (aka Maremi) is hosting a great challenge on her You Tube channel, all about art journaling - just the thing to inspire me to grab one of my long neglected journals, roll up my sleeves and start creating. The title of the first challenge is 10 Minute Art and that's just what it is - create an art journal page in just 10 minutes. I'm going to admit to a bit of cheating. I'm using a sketch book that I picked out of the bargain bin some time back. The pages are just too thin for mixed media, so yesterday, I adhered adjoining pages together using matte gel and now they can take anything that I want to throw on them! We are allowed to gather all of the things that we'll be using, so I selected a sheet of Kaisercraft pattern paper, a bunch of tags, journaling strips, a jar of trims, clear gesso, heavy gesso, seed beads, mica powders (Prima Art Basics in Teal and Pale Silver), a Blue Fern Studios chippie, a black ink pad, a stamp, and a stencil. Oh, and my focal item - a wood icon in the shape of a clock in honor of the 10 Minute Challenge. Time to start, and I cannot believe how quickly I worked! First, I gave the pages a very rough coating of clear gesso with my palette knife. I wasn't careful to coat the entire surface and I left a lot of small hills and ridges here and there. A quick blast with my heat tool and I was ready for the next step - applying heavy gesso through my stencil here and there around the pages. Another quick blast of heat to (mostly) dry the surface and on to the next thing - I ripped the paper into pieces and layered them with the tags, stapling them together when I was satisfied with the shape. (I learned this stapling trick from Cindy Brown and I use it a lot when I'm layering papers.) I used heavy gesso to glue on these layers and a bit more to adhere my chippie pieces, the trims and my clock. And now came the fun - I dusted the mica powders around the page with an old brush, spritzing with water and tilting the book to spread the colors, then slightly drying. I did this several times to create layers of color. Next, I spread a bit more of the heavy gesso around and left some of it bare and covered some of it with seed beads. One peek at the clock and gahhhhhh! I'm almost out of time!!! Quick - a few dabs here and there with my stamp and - yes, I can do it! - a couple of journal strips and I made it!!! I'm usually such a slow scrapper that I was really surprised that I could meet this challenge and end up with something that I'm pleased with. Thank you so much, Marta, for coming up with this!!! !